To get a signal, the satellite dish must be pointed directly at the satellite, with NO obstructions between the two. This means NO trees and NO buildings. Take into consideration future tree growth, house remodeling or additions and new construction in your area.The satellite signal WILL NOT PASS through leaves or branches. Your LNB is marked with a label indicating the polarization tilt. Your local LNB polarity offset information varies by location. If you are in Houston, TX your LNB polarization is to be set at 0 degrees. But if you are on the California coast your LNB polarization could be as much as minus 30 degrees (clockwise rotation). 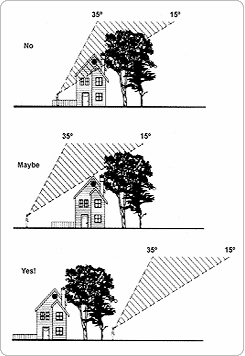 And if you are in Maine your LNB polarization could be as much as plus 30 degree (counter-clockwise rotation. Peaking the dish and adjusting the polarity of the LNB will greatly improve your Signal Quality reading. When adjusting your LNBF, be sure you don't leave that LNBF holding bracket loose. The LNBF won't pick up the satellite if the bracket is loose, and it's slightly off. Finally, when thinking about degrees, remember that 30 degrees is about 5 minutes on a clock. Don't turn the LNB too much! Make certain that the pole or tri-mast assembly is vertically plumb. Check it with an Angle Finder or a level. If the pole or tri-mast is not plumb, your azimuth and elevation will not be accurate and will cause difficulty when pointing the dish. Also, if you are using a pole mount, make certain you pour a sufficient footing that will provide proper ballast. A pole that does not have sufficient ballast will lean over time, causing you to lose the signal. Your mount must be very strong and can not wobble. You must use at least 4 lag screws (correct size for your installation) in the base mount one on each corner. When pointing the satellite dish, allow 5-10 seconds between any movements of the dish. This allows the receiver to complete a signal scan, and lock indicating that you have located the signal. A reasonable signal strength is between 50 and 80. If it is lower than that range, you are either pointing into an object (e.g. trees, shrubs, or structures) or pointing above or below the satellite. Your antenna installation position must have a clear view angle of the satellite you are trying to receive. There are other satellites within 2 degrees to the left or right that may use the same frequency. This will provide a strong signal strength reading but no signal quality or signal lock. If you have a high strength reading but are not able to lock on, try adjusting the dish slightly to the right or left. When you are attempting to set up a satellite dish in a heavily wooded area or one with lots of man made obstructions, it helps to understand how the dish really works. One common misconception is that the dish points 'directly' at the satellite. This isn't the case for most dish designs. The apparent elevation of the dish is 15 or more degrees lower than it's actual receiving window. If you complete the above steps properly, your chance of a successful installation is 99.9%. If you use a signal meter you can hook it into the system right at the dish and it responds to the signal immediately making it much easier to aim your dish. You do not need any one else to help you if you use a meter at the dish. If this is the symptom you are experiencing, then the receiver is currently not receiving the signal from the dish. Check all connections between your receiver and the dish. Make sure that they are all plugged in to the proper place and are tight. One of the most common connection problems is to have the cable coming from the dish plugged in to the connection marked "In from Antenna," which is incorrect. The cable coming from the dish needs to be plugged in to the connection marked "In from Dish, Digital In, or LNB IN"One of the most common connection problems is to have the cable coming from the dish plugged in to the connection marked "In from Antenna," which is incorrect. The cable coming from the dish needs to be plugged in to the connection marked "In from Dish, Digital In, or LNB IN"
Also, the cables might have developed a short or might have gotten moisture in them, especially out at the dish. If this is a possibility, you may want to have an installer check the cables or take them to an installer yourself. If you are experiencing these levels of strength and quality, you are getting only noise signals. Make sure that there are no obstacles between the dish and satellite. With this level of strength and a lack of quality, it is very likely that the dish has moved since its initial installation or you are still off alignment. We recommend going through the Dish Installation pointing steps and finding the satellite signal again. This will likely take just a few minor adjustments of the dish since it should not have moved very much. Key causes for this problem include bolts not being tightened properly, heavy winds, or the dish being struck or bumped by something. Once the signal has been found again, make certain all bolts are tightened well. We also recommend that once you have everything tightened down and have your signal back, make a mark from the cap mount to the pole with paint or some other permanent substance. This will give you a reference point, should any future problems occur. You can also make a mark on the side of the cap mount where your elevation markings are imprinted. This level of strength and quality indicates that the dish may need to be fine-tuned to the satellite. You may have noticed that prior to getting the "Bad or No Signal" message your picture was occasionally blotchy and your audio may have been out of sync with the picture. These are all symptoms of the need to fine-tune the dish. Optimum signal quality is between 70 and 100, however each receiver has a different scale. On some receivers, 40-60 is considered optimum signal. A typical sign of a low signal, is a channel that is breaking or pixelating all the time. Also a channel that pixelates with the slightest cloud cover or change in weather is also a sign of a low signal. On the Evolution XO-01 receiver the optimum signal is 40-60. TIP: You can fine-tune your dish by going back to the signal strength screen. While the signal bar is running, have someone out at the dish. He will need to loosen the collar that holds the LNB. This is done by slightly loosening the two screws that hold the collar together. Once these screws are loose, slowly twist the LNB a fraction of an inch. After each movement allow 5 seconds for the receiver to register the change and update your quality reading. If the quality readings immediately begin to get lower while the adjustments are being made, then the LNB needs to be turned in the other direction. Once the LNB fine tuning is complete, tighten the two screws on the LNB collar. You may then complete the scan by pressing START.